While the government thrashes out ways and means to ensure raw material and boost green power plants, a biomass power plant had to shut shop unable to cope with the raw material crisis. Rising prices of biomass led the 7.5 MW Konark biomass power plant in Karnataka’s Tumkur district to close down in September 2008. M Kumaraiah bought the plant in 2007 because the earlier owner could not run it in the existing market conditions. “The rate of biomass has gone up phenomenally,” Kumaraiah said, “In 2005, when the plant became operational, rice husk cost Rs 800 per tonne, but now rice husk costs Rs 2,400 per tonne or even more, and groundnut husk costs Rs 3,000 per tonne. It is now impossible to produce power at the old tariff.” He attributes the steep rise in costs in areas close to Bengaluru to the rise in the number of small industries, brick kilns mostly, which now use biomass fuel. When Konark power plant was commissioned in 2005, the tariff for power was Rs 3. 24 per unit. By 2007, Chandrashekhar, the then owner, found it impossible to run the plant at this tariff, and sold out to Kumaraiah. He ran the plant till September 2008, after which he too closed it down following losses. 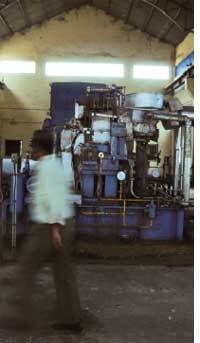 When in January 2009, the government offered a tariff rate of Rs 5 per unit, the plant ran for five months. In May 2009, the order was withdrawn and the old rate was imposed causing the plant to close down again. The 7.5 MW Konark biomass power plant in Tumkur district of Karnataka which generated Rs 1.01 crore in carbon credits by selling 12,599 CERs to Germany in 2009 still could not manage to sustain operation. It operated for 2000 hours in 2009 but according to Kumariah, Managing Director of Konark corp the carbon credit benefit can not be used to meet the losses being incurred with operations, maintainance and raw material costs. “To run plant for a day, it costs about Rs. 6 lakhs for 270 tonnes of fuel and Rs 73,500 in fixed and variable costs,” he said. The annual cost last year was Rs. 4.94 crore for the fuel for 2000 hours that the plant was operational and 2.68 crore for the remaining annual expenses. Kumariah said that the revenue generated with 132 million units last year, the revenue could offset Rs 4.25 crores at the tariff of Rs 3.24. “That is the reason we ran into losses of more than 1 crore in a year even with the CDM benefits coming our way,” he said. Kumaraiah said he is going to take up the issue with the Karnataka Electricity Regulatory Commission (KERC) with other biomass power producers. They too find it difficult to run their plants at at power tariff that was fixed when the plants were commissioned, he said. Andhra Pradesh biomass energy developers have often asked for higher tariffs as most units are dependent on rice husk whose prices have increased phenomenally in the last three years—from Rs 200 per tonne to Rs 1,500 per tonne. When the state government did not increase tariffs, it led to the closure of some plants. The promoters of 30 biomass power plants, with a capacity of 170 MW and investments of up to Rs 800 crore, recently issued a statement under the banner of Biomass Energy Developers’ Association that their key problem was procurement of biomass. Karnataka biomass industry bodies have also said that availability of biomass is a crucial problem and asked for higher tariffs. Since the electricity tariffs are fixed for a certain period while the biomass prices are volatile, dependent on supply and demand in a certain region, many biomass plants have not been able to sustain operations in Karnataka, said Ramesh H Nagar, deputy general manager at Karnataka Renewable Energy Development Agency (KREDA). “Probably that is the reason we have not received applications for new biomass plants,” he added. The government though is determined to pursue biomass energy. A senior official of MNRE said that electricity generation using biomass is being promoted by the government since it has little emissions. “Biomass contains carbon, hydrogen and oxygen molecules, complete combustion would produce carbon dioxide and water vapour. Partial burning produces carbon monoxide and hydrogen, which are combustible gases,” he said. He added that biomass gasifier gensets are aimed at replacing diesel gensets in rural applications like water pumping as well as industrial applications like captive power generation. The target for the 11th five year plan, ending in 2012, is 500 MW of biomass power. “Many implementation troubles will come up in the plan period. It is unlikely that India will achieve even a fraction of the theoretical potential of 17,000 MW in the foreseeable future,” an MNRE official said.